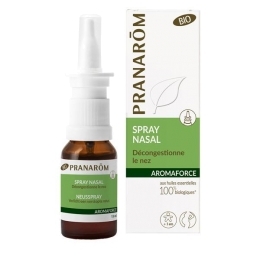 Pranarôm Aromaforce Throat Spray is an elixir for the throat with natural pure essential oils. Aromaforce throat Spray refreshes breath and has a soothing effect on a tickling or hoarse throat. Its composition is strengthened by propolis and a concentrate of blackcurrant buds, which help the body to boost its natural defences. May be used 3 to 8 times a day ; Hold the nozzle of the spray horizontally and direct it towards the throat or mouth, opening this wide. 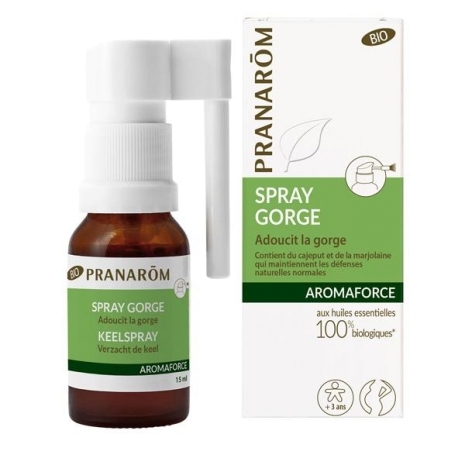 Adults, children from the age of 12 and pregnant women : up to 3 sprays per use. Children aged 6 to 12 years : 1 to 2 sprays per use. Children aged 3 to 6 years : 1 spray per use. Aqua, Ficus Carica Syrup*, Glycerin, Propolis Extract*, Ribes Nigrum Gemae*, Essential Oils (2.0%) : Citrus Aurantifolia Oil*, Melaleuca Cajeput Oil*, Mentha Arvensis Oil*, Origanum Majorana Herb Oil*, Origanum Compactum Oil*, Cinnamomum Zylanicum Bark Oil*, Xanthan Gum.